Severe Chevy Volt crash screams a question: Is the Volt really incendiary? A severe crash last week destroyed a Chevy Volt, but caused no fire, casting doubt on the whole political firestorm last winter over the Volt fire risk. A horrible accident last week in Geneseo NY destroyed a Chevy Volt. Because that Volt did not burst into flames, the event calls into question the whole politicized drama of recent months in which right wing Republican politicians tried to label the Volt as an incendiary fire risk. If the Volt is so incendiary, then where's the fire? According to a report in the Livingston County News, the crash occurred on May 23, and involved a motorist, driving a Toyota Camry, who failed to stop at an intersection. Instead the Camry went through the intersection, hopped over a ditch, plowed across a lawn, struck two cars sitting side-by-side in a driveway, pushing the cars back 25 feet, and causing damage to the house. The car taking the brunt of the damage, a brand new Chevy Volt, was destroyed beyond recognition, in part because the Camry landed on top of the Volt. The 1998 Grand Cherokee Jeep sitting next to the Volt was also damaged enough to be declared a total loss. The collision caused a fire in the Camry's engine, quickly put out by neighbors, and sent the Camry's driver to the hospital with severe injuries. In short this was an extremely severe accident, with the picture (provided by the Geneseo Police Department) telling the story in a way words cannot. To give context let us review the, uh, firestorm concerning the supposed fire risk of the Chevy Volt. 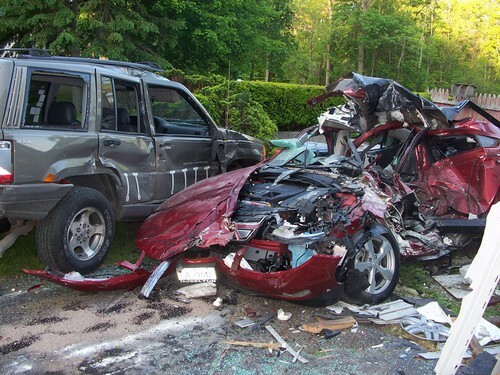 On May 12, 2011, a crash test under the NCAP program was conducted by a NHTSA contractor in Wisconsin. While the Volt earned a 5-star crashworthiness rating, the car crashed on the 12th caught fire during the weekend of June 4-6, 2011, 3 weeks later. All through the summer engineers from the DOT, NHTSA, EPA, GM, NASA and other organizations did a forensic and failure analysis of that fire, and eventually in November 2011 the fire was revealed to the public and shortly afterward the NHTSA launched a formal investigation. Almost immediately right wingers began pounding on the Volt calling it an incendiary fire risk, linking the supposedly risky Volt to a narrative about Pres. Obama's supposedly failed green jobs strategy. While the political drama over the Volt fizzled shortly after the NHTSA report on the Volt fire, and January's testimony before Rep. Issa's House Committee on Oversight and Government Reform, last weeks crash involving a Chevy Volt gives us an opportunity to revisit that mess. That political drama would have validity if there were actual fires of Chevy Volt's in the real world conditions. But there have been no Volt fires, despite a few crashes involving Volt's. Last week's crash shows a Volt subjected to a more severe crash than last years crash test. Yet, the only vehicle catching fire was the Camry, not the Volt. In the meantime gasoline car fires occur at the rate of 250,000 per year, sometimes resulting in fatalities, as almost happened in this case. The only other fires involving Chevy Volts were three garage fires last year. In each case a Volt happened to be parked in a garage that caught fire, and in each case fire investigators cleared each of the Volt's from having caused the garage fire. In the Geneseo incident, the system worked as GM said it would. According to the Geneseo Police Chief, the Volt owner reported that GM engineers showed up within two days, dispatched from Detroit, and depowered the battery pack, just as GM said is the appropriate response. GM also took possession of the Volt, presumably to study it further. Having carefully reviewed the NHTSA report into the crash test fire, it's clear GM and the NHTSA want to understand how to best protect the battery pack from damage, and a Volt subjected to this severe of a crash would give engineers a treasure trove of damage data to study. In the mean time there is no indication this Volt will catch fire, despite the damage it suffered. The last item to ponder is the political firestorm during which the Chevy Volt was treated as a punching bag. On reflection, is there any validity to that political firestorm? No. The current political climate is going through waves of vilification, tarring chosen targets with sometimes unwarranted untrue false allegations. Is this really the healthiest way to conduct politics? To sling falsehoods around in an attempt to tarnish opponents? Is this how we really want our society to be governed? Always entertaining when reality gets in the way of the radical right winger's propaganda campaigns. Its not about being on the right or the left, it's about money, the old tech oil and car companies have it, the politicians want it, so they "support" the old and try to delay the new. It really is that simple. It's just much easier to see when the new reduction is as bullet proof as the volt is.. Wow, Gm finally built a real car! I really like your point at the end of the article about how American Politics have disintegrated into such harmful garbage. It is actually very disturbing when objective factual review goes directly against what has been widely presented as truth: disturbing because it is a commentary on the health of our society. Very well said, ViperRT10Matt. It is really as simple as you say. I do agree. The right-wing's obsessive, wacky, and fictional attack on the Chevy Volt was just about badmouthing Obama's decision to rescue of GM and his support of green technology. Rupert Murdoch (Fox news and their ilk) thinks painting the Volt as a failure will somehow translate into election wins. It is further indicative of Murdoch's organization's willingness to lie and deceive. Here's a dose of reality for you to enjoy, the Dolt is a commercial failure. The purpose of GM isn't to push a political ideology, it's to produce cars people want to buy at a profit. That one Dolt didn't burst into flames on impact does not make the Dolt any less a failure. As a former BMW owner (and soon to be Volt owner) I'm shocked that Congressman Issa and his Republican colleagues haven't called for hearings on BMW. In fact I haven't heard a word about the recall of 3-series cars (at least in Europe) for having battery fires? Given their great concern for the safety of their fellow Americans, you think they would show at least as much concern about foreign-built cars (and Amerca's best selling luxury car) of which there are millions on the road as they have about a couple of Volt crash test fires. Clearly their concern has nothing to do with cars or safety -- but trying to embarrass Obama and GM. How un-American! To say the least. Thanks for the Actual facts! I do appreciate your article. I've been trying to spread the word about how awesome the Volt is, and people only remember the bad stuff. People still ask me 'what happens when the battery runs out' and 'aren't they dangerous'. The GOP's disinformation really has done some damage to the Volt's reputation, but i'm hoping reality will prevail. Had a talk with a guy today who has been in the EV field for 18 years, is an electrochemical engineer, and currently heads an EV producing company that does not compete with GM or the Volt. He and some colleagues purchased a Volt and tore it down, bolt-by-bolt. He says it will be amazing if it doesn't have serious maintenance issues in the next year or two. It is horribly designed as an afterthought and wasnt meant to be put into production. I had a talk with doctor from the local psychiatric hospital. He told me about an escaped patient who goes by the name "Suthy", who recently escaped. My 2007 Chrysler mini-van stalls for no reason and the Check Engine light lit intermittently for 5+ yrs now. My dealer found no problems and says it's normal. The fusible links burnt out when I lowered the front driver and passenger windows, in both my 2005 and 2007 models. Since new, the weatherstripping falls out every time I lower the windows. Seems like serious maintenance issues to me too. Whatever 'bro' (i never use that word). Gee, your friend must be sooper smart, cuz the Volt just won every automotive award in existence. Even if there was a shred of truth to your comment, which i doubt...the Volt is under warranty for 8 years...or if you're really paranoid...you can lease the car for 3 years. Please spread the disinformation elsewhere please...maybe on a toyota/nissan blog...or 'oil monthly'. If you really are 'legit', then ask your 'friend' to post HIS credentials, and the exact reasons why he believes the Volt's engineering is flawed...and then the rest of the world can scrutinize his theory. I know a guy who knew a guy who had a talk with a guy and he said..........................Whatever. Fact; Awards galore including European car of the year. Every Vauxhall Ampera (UK version of the Volt) is sold with a lifetime warranty and an 8 year 100000 mile battery warranty. Then why is it winning international design awards from engineering , metal fabrication and production, and McRae industry associations ? Face the facts, it's the best designed and built car to Come out Detroit in years! Auto correct does it again... "McRae" should read "Auto". I have now turned off this nice feature. We have all heard of the list of awards the Volt has received for its design, but Just to help here are are the ones that really counted for me: "Top Safety Pick" Insurance Institute for Highway Safety, - A Five star safety rating is nice, but what does it mean to my inusrance costs? try 10% lower than the 40k Audi I was looking at buying. Automobile Magazine 2011 Automobile of the Year - speaks for itself. Top 10 Best Engines - by wards auto , awarded to vehicles that outperform in terms of power and torque output, noise, vibration and harshness. The volt is a nice luxury car ride period! these are all sponsered by gm magazines. gms are allways car& driver best picks year after year but look in the back of car&driver mags youll find sponsered by chevrolet and i bet those you mention are also. my local news station is sponsered by gm and they never report gm recalls or robbing tax payers , they'll run other manufactures recalls for days, i hear about gm recalls here on tn. Sounds like polite slander. Who is this expert saying Volt will be a maintenance problem and was designed as an afterthought? What did he specify as potential problem areas for the Volt? I think GM would beg to differ that it "wasn't meant to be put into production." The above comment was to "Suthy." I hit "reply" but it wound up well below the Volt being a future maintenance problem comment. The plural of Volt is "Volts", not "Volt's"
I am a Volt owner but I can't resist asking; Don't you have to wait 2 - 3 weeks for it to catch on fire? All cars have a lot of energy stored in them and are a fire risk after a severe cash. You don't wait for fire. Standard protocol is to drain gasoline (and electricity in an electric car) after a severe crash. The lab fire in the Volt happened because gas, but not electricity, was drained after the crash test. Whoopty doo i wrecked in a 79 pinto once and it didnt blowup but it was banned probably because it got 30+ mpg in 1979. O my Gosh, the Camry caught fire. Recall all Camrys!!! Fox News make sure you cover it and its probably Obamas fault. Wonder what the Camry looked like? ?